SoundCloud has suffered one of the worst leaks that they have had to deal with in quite some time. On Wednesday evening it came out through twitter that SoundCloud was hacked, releasing the private links to a large collection of songs. 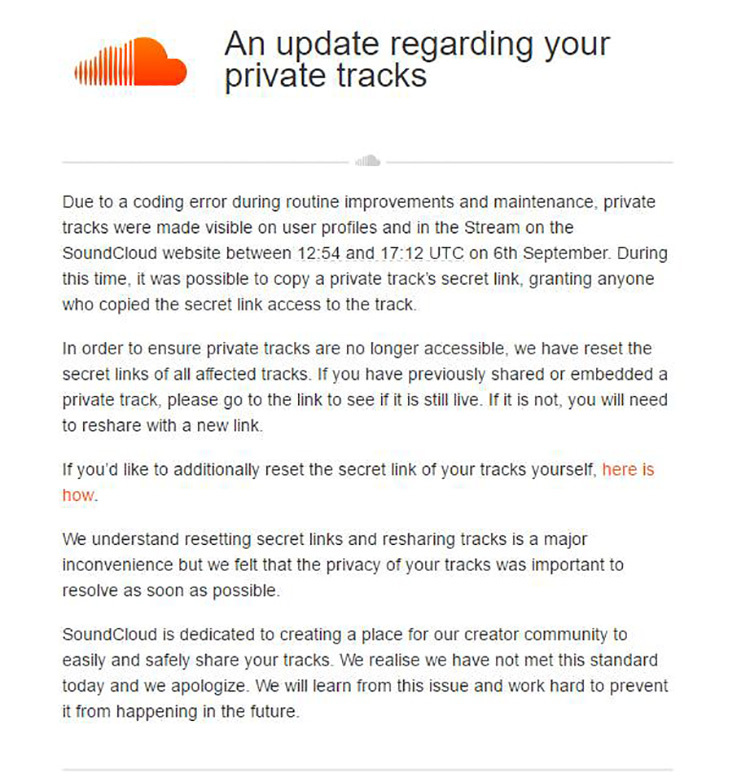 In a statement released to certain subscribers, SoundCloud stated “Due to a coding error during routine improvements and maintenance, private tracks were made visible on user profiles…” According to the email, the problem occurred between 12:54 and 17:12 UTC on September 6th. During this time, any links that were private songs could be copied, and therefore able to be shared with whomever pleased. Artists who had private songs were asked to check if their songs were still public or if they were private. They would need to get a new private link to share their songs. SoundCloud would not allow any private songs to keep their old links, cause inconvenience for PR to run smoothly. Concern and outrage was expressed on twitter as SoundCloud attempted to resolve the issue. Complaints about private tracks and whole demos being ripped from SoundCloud were found all over as complains on twitter. Soundcloud documented the issue here.